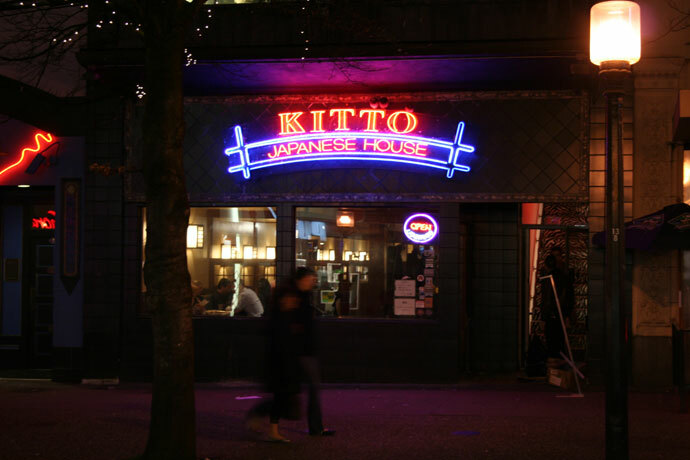 Kitto Japanese House (833 Granville Street, Vancouver, BC, Canada, phone: 604-687-6622) is a busy Japanese restaurant in the heart of the downtown Granville Street entertainment district. Click here for some food photos and more info. 12,226 views. This entry was posted on Saturday, March 15th, 2008 at 10:57 pm	and is filed under Granville Street, Japanese, Open Late, Sashimi, Sushi, Sushi Bar, Vancouver City Scenes. You can follow any responses to this entry through the RSS 2.0 feed. You can skip to the end and leave a response. Pinging is currently not allowed. This restaurant is now closed. See ShuRaku instead.